A local history and genealogy site for Wimpole, a village and parish in South Cambridgeshire. This image was taken in the playground of Arrington School about 250m north of Arrington village on the west side of the A1198. 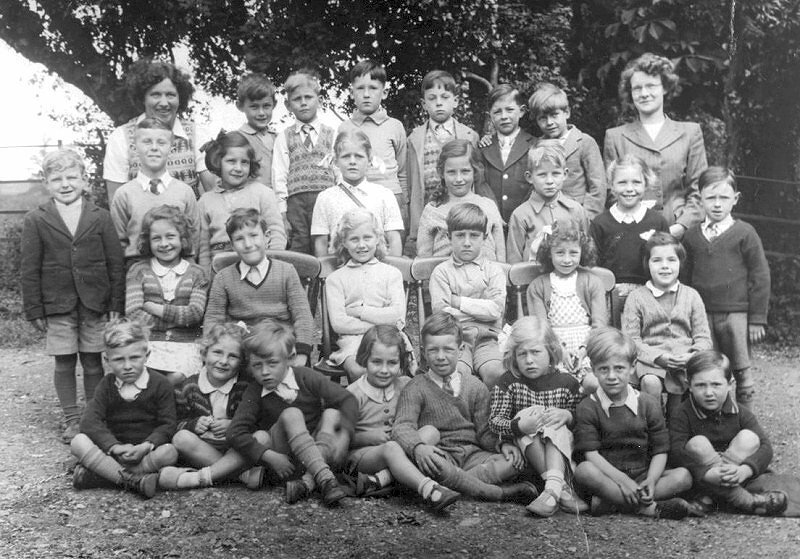 Back row (left to right): Teacher Miss C Whitmore (later married Sam Edwards), (boy), David Miller, (boy), Alan Goats, Nigel Hall, (boy), (unknown teacher from Wimpole Park School). Third row (standing left to right): Stanley Tokley, John Sellers [see below], Lynn Parish, Ann Senior, (girl), John Pearce, (girl), (boy). Second row (sitting on chairs left to right): Joyce Taylor, Michael Northrop, (girl), John Chapman, Wendy Hall, (girl). Front Row (sitting on mats left to right): Kenny Bonfield, Joan Taylor, Clive Smith, (girl), Frank Standen, Sheila Starling, George Clarke, Trevor Patterson. Please contact the website if you have any other Wimpole Park photographs of the school or pupils. We are also seeking the missing names. All help would be appreciated. "My name is John Sellers (DoB 27/03/1942). The group was at Arrington School, and I am the ‘boy’ in the photo standing in front of Miss Whitmore and beside Stanley Tokley. I was recovering from a head injury at the time, which was the reason for the pudding basin haircut! I believe the year was 1949. Sadly, my mother died of cancer in May that year. My father was a lecturer at the Emergency Teachers Training College, Wimpole Park. When the college closed in 1950 my family re-located to Cambridge where I went to Brunswick School and then The Perse School. "I left school in 1960 having gained a commission into the Royal Navy and was selected for aircrew training. For the next 32 years I served in the Fleet Air Arm flying various types of helicopter and the Jetstream aircraft. Towards the end of my Service I was appointed MBE for services to Naval Aviation. It was all great fun, but when I reached my ‘sell by date’ (50th birthday) in 1992, and by which time I was a Lieutenant Commander, I had to retire. "My first civilian job was Bursar at Douai School; an Independent School attached to a Benedictine Monastery situated in Berkshire. For the next 5 years my boss was a monk! In January 1998 I moved on, to work for Guide Dogs for the Blind Association as the Administration Manager at the Guide Dog Training Centre in Wokingham. In 2002 I moved on again to become Property Manager for James Cowper Kreston Accountants, responsible for the firms six offices located around the southern counties. "I retired in 2012, just after my 70th birthday. "I am married to Felicity, we live in a village close to Newbury, and have two adult children – Christopher and Juliet. "I was fascinated to find so much about the personal stories and history relating to Wimpole Park, and thank all who have contributed to such an interesting site."